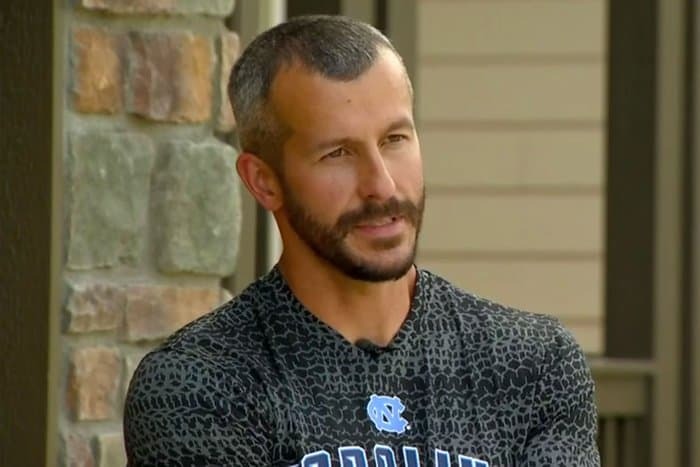 When Chris Watts was arrested for the murder of his pregnant wife and two daughters, it was revealed that he was having an affair at work. It turns out Watts may have led an extensive double life and possibly had many affairs behind his wife Shan’ann Watts’ back. This week a man spoke to Ashleigh Banfield on HLN’s Crime and Justice claiming to be Watts’ ex-boyfriend. He said he had a 10-month relationship with Watts that ended this May or April, so he would not be the person Watts was currently having an affair with. 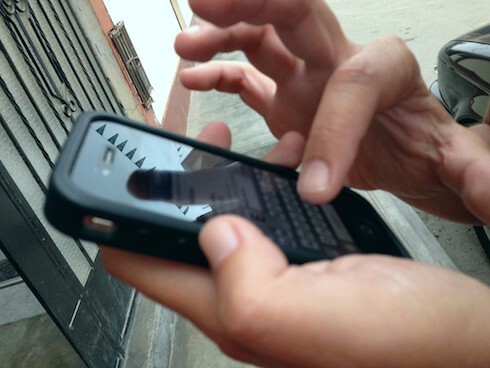 Now, a man named Trent Bolte has claimed on Facebook to the be person who spoke to HLN. According to PEOPLE Watts has had affairs with multiple people, both men and women, throughout his marriage to Shan’ann Watts. “He told me that he was the victim of emotional and verbal abuse and he was trapped in a loveless marriage and he didn’t know of any way out because of his kids, because of the girls,” the man told Ashleigh Banfield. He was a call-in who they allowed to speak even though they could not verify if what he was saying was true. Ultimately all the things he said could be gleaned from the information known to the public. Whether or not this man had a relationship with Watts, or if the man is Trent Bolte is still not known. In his long post on Facebook, Trent Bolte says he did not know Chris was married until February of this year. 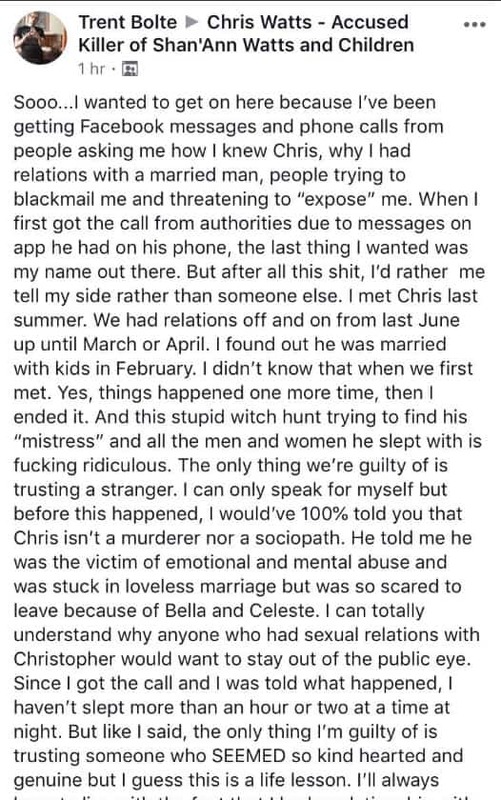 He says he was speaking out because there is currently a “witch hunt” trying expose the people Chris cheated on his wife with. Part of the social media pressure to identify these people includes the hashtag #mistresscomeforward. “The only thing I’m guilty of is trusting someone who SEEMED so kind hearted and genuine,” Trent explains. “But I guess this is a life lesson.” He says police have contacted him after going through Watts’ phone. Chris Watts (33) has admitted to strangling his 34-year-old wife Shan’ann, but he claims he did this after he witnessed her strangling their two daughters, 3-year-old Celeste and 4-year-old Bella, on a baby monitor. So far it is unknown to the public if there is footage of this alleged occurrence. Watts had recently admitted to Shan’ann that he was having an affair with a coworker. He disposed of his wife’s body in an oil field where he worked, and placed his children in oil and gas tanks. Chris is reportedly under suicide watch in jail. 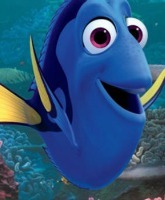 Prosecutors don’t believe his story about how his family died. He was charged with five counts of first-degree murder and a first-degree unlawful termination of a pregnancy. VIDEO – The “prosperity gospel” legacy of televangelist Oral Roberts: Con Man or Man of God?